Dois quartos 2 º andar duplex, 2 camas queen size. Entrada privada com estacionamento na rua. Chave menos entrada leva você até as escadas para uma cozinha completa com todos os aparelhos e banheiro completo. Apartamento está equipado com todos os lençóis, utensílios de cozinha e apresenta 40 "TV LCD na sala e 32" TV no Master e 2 quartos, jogos de tabuleiro e cartões, Keurig cafeteira, todos os aparelhos, lavadora / secadora na unidade, ar condicionado central, premium cabo e WiFi, ferro / tábua de passar. Câmeras de segurança em locais fora apenas. NÃO É UMA RESIDÊNCIA À PROVA DE CRIANÇA. Centralmente localizado em Millvale, PA fora de Rota. 28, saída 3. Passeio de carro de cinco minutos para Lawrenceville e Bloomfield comunidades, Strip District, Downtown e do Distrito Cultural, PNC Park e Heinz Field. 10 minutos de carro do Zoológico e Aquário de Pittsburgh, Carnegie Science Center e Carnegie Museum. Se comparecer aos concertos Pirate ou Steeler, Penguins ou Stage AE, Mike ficará mais do que feliz em dirigir nossos convidados para os locais e depois você pode levar e UBER voltar para a unidade. Our hosts were very hospitable and made us feel right at home. The home is very comfortable and a nice relaxing place to rest. The snacks, water and coffee were definitely a plus. We didn't even go to the store since we took our lunch and dinner meals out on the town. I would definitely stay here again! I spent two days in town to take my children 7 and 11 to local museums and attractions. We toured the Carnegie and the National Aviary. Both were excellent, the Carnegie is definitely must see. We had reciprocal agreements with our local zoo and museum so was very inexpensive. The home was a good location for us and very close to multiple attractions by car. 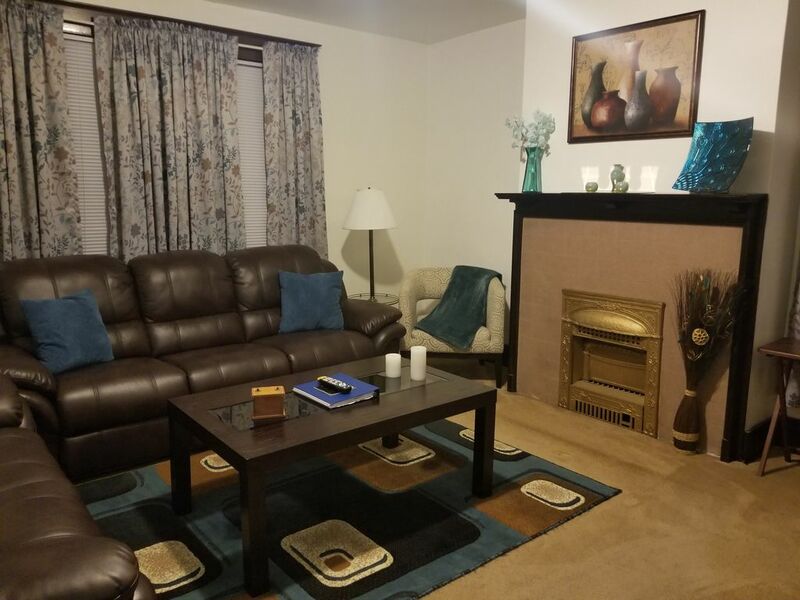 Very clean and well appointed upstairs unit that was also very quiet and restful. Thanks Christopher. It was a pleasure hosting you. Please come back anytime! It was just like being at home. Everything was well kept and if you forget anything it is provided as an extra. Parking was easy and it is conveniently located to go most anywhere in 10-15 min. Thank you Amber. We are so happy that your enjoyed your visit and were comfortable. Please come back anytime you are in the area! We stayed for 5 days over thanksgiving. The location was perfect right between my family and downtown. It is far enough from the center of the city to be a quiet and comfortable place to crash between adventures but still close enough to make for a quick trip to any part of town. Barb and Mike really do an amazing job preparing this house for guests. Everything down to drinks in the fridge, even shampoo and tissues. We could have lost our luggage at the airport and still been alright (aside from clothes, but that would be asking too much :) ). Thank you for a pleasant stay and we will surely look here first next time we are visiting Pittsburgh. Thank you so much for the kind words. We are so happy you enjoyed your stay and your visit to Pittsburgh. Please come back anytime, we would love to have you! Barb and Mike have made their home such a cozy and comfortable place to stay. It is very convenient being close to the city, but just far enough away from the chaos. On street parking was a big plus! The unexpected extra touches in the home were a pleasant surprise. From coffee, creamer, and sodas to extra toiletrees; they have thought of everything to make a stay at their home a great experience. They have the most comfortable beds I have ever slept on while away from home. I would highly recommended their home to anyone visiting Pittsburgh. We only stayed one night and hope to return whenever we visit again. Deve visitar Pamela's para o café da manhã. Tazza D'orio coffee Agora está aberto. A padaria francesa de Jean Marc é uma obrigação. Duas cervejarias na área, Grist Houst e Drai Laag, Sr. Pequeno teatro e a trilha de bicicleta / caminhada da nossa área de Millvale para o centro de Pittsburgh, ao longo da beira do rio.